This 19th century version (MP3) of the Star-Spangled Banner was performed on original instruments from the National Museum of American History's collection. Arranged by G. W. E. Friederich, the music is played as it would have been heard in 1854.
" The patriot who feels himself in the service of God, who acknowledges Him in all his ways, has the promise of Almighty direction, and will find His Word in his greatest darkness, 'a lantern to his feet and a lamp unto his paths.' He will therefore seek to establish for his country in the eyes of the world, such a character as shall make her not unworthy of the name of a Christian nation. " " Then, in that hour of deliverance, my heart spoke. Does not such a country, and such defenders of their country, deserve a song? " A Family Song During the 19th century, “The Star-Spangled Banner” became one of the nation’s best-loved patriotic songs, performed during both public events and more personal gatherings. Beautiful Vocal of "The Star Spangled Banner"
What Are the "Broad Stripes and Bright Stars?" What Can You Learn From Primary Source Documents? Only two original copies of the poem survive today. In 1813 the commander of Ft. McHenry asked for a flag so big that "the British have no trouble seeing it from a distance." He asked Mary Young Pickersgill to make the flag for him. Her thirteen year old daughter Caroline helped her. She used 400 yards of fine wool. After this attack, the Americans knew that Baltimore would be attacked next. The British had captured Mr. Key's friend, Dr. William Beanes. Key and another man set out to try to save Dr. Beanes' life by telling the British that the doctor had helped to save British soldiers who had been wounded. The British agreed to free Dr. Beanes, but the three were placed under guard on a British ship because they had overheard the British making plans to attack. It was from this ship Francis Scott Key watched the bombing of Ft. McHenry. When daylight came, he could see through the smoke and haze that the flag was still waving. Key was so inspired he began to write a poem on the back of a letter he had in his pocket. He later finished the poem and showed it to his brother-in-law who took it to a printer. Two of these copies survive today. Newspapers started printing the poem and people began singing it to a familiar tune. The Star Spangled Banner was adopted as our national anthem on March 3, 1931. Fort McHenry as it was depicted in Harper's Weekly on the 13th of July, 1861. Credits Image from the Library of Congress. They cut 15 stars that were two feet across. There were 8 red and 7 white stripes. The stripes were each two feet wide. When it was finished it measured 30 by 42 feet and cost $405.90. In June of 1813, Major George Armistead took command of Fort McHenry, the garrison which guarded the water entry to Baltimore, Maryland. This flag, one of two which he commissioned, measures 30 by 42 feet and was intended to fly over the fort on a flagpole about ninety feet high. 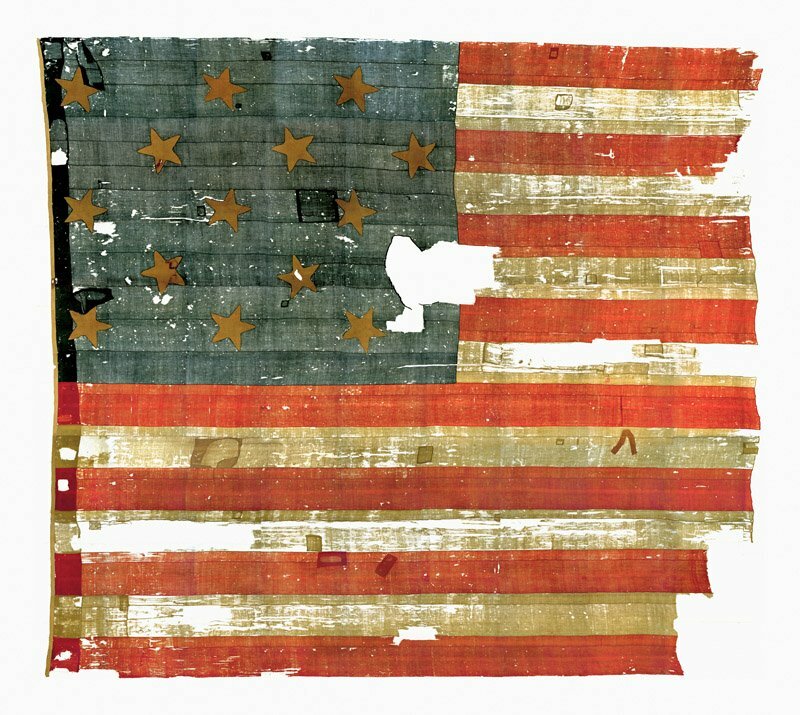 This garrison flag - known today as The Star Spangled Banner - has fifteen stripes and fifteen stars (unlike the modern American flag which has thirteen). Why is that? After Armistead's successful defense of Fort McHenry, the flag remained with the Armistead family - as their private property - for ninety years. It is now one of America's most significant national treasures. The original song: "To Anacreon in Heaven." has its genesis as an English-American hybrid. The music as we know it today is English in origin. Ralph Tomlinson, president of the Anacreontic Society, a London social club, wrote a poem in 1770 called "To Anacreon in Heaven." A year later John Stafford Smith, an organist and composer set the poem to music. Forty-three years later Francis Scott Key, a poet-lawyer, witnessed the valiant defense of Fort McHenry by American forces during The Battle of Baltimore. One thousand dedicated Americans stopped the British advance on Baltimore, and on September 13, 1814 when he saw the American flag flying over Fort McHenry "by the dawn's early light,"
Francis Scott Key changed the words of the original tune from England, replacing them with his own. He named it The Star-Spangled Banner. In 1931 the Congress of the United States enacted legislation that made the song this country's official national anthem. "The Star Spangled Banner "
More on the War of 1812, and specifically the Star Spangled Banner, visit the Smithsonian's Resources for Kids from the Star Spangled Banner. On September 11, 1814, the British Fleet arrived at the mouth of the Patapsco River. Thus began the Battle of Baltimore, which inspired Francis Scott Key to pen The Star-Spangled Banner. Featuring Aretha Franklin's soulful, heartfelt voice, our flag's broad stripes and bright stars will shine through in all our children's voices as they sing along in celebration of America's unity and strength.